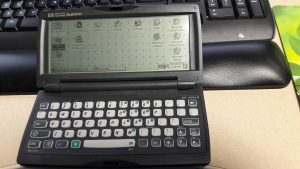 Sharp Zaurus, Palm, and Palmtop Computing | Keeping handheld computing alive! I have 2 new handheld devices coming. The more interesting device is a HP Jornada 690. It is a cute little color palmtop, to compliment my 360LX. The 360LX is a fun device, but the keyboard is lacking. I am sure it will stay in the loop, since it has simple batteries and good battery life. The second device is an USB IrDA port for my dana.wireless. Sometimes I just want to sync without plugging a cable in. I am sure it will work well with my dana, but I am pretty sure it will work with my other Palm devices. I’ll keep you all posted when they land. A comparison of the dana.wireless by Alphasmart and the 360LX by Hewlett Packard. These two systems came out about 4 years apart, so not a completely fair comparison, but let’s try anyway. So, what is it like to use a handheld PC from 1997/1998? To be honest, the keyboard is pretty awful, but I think it is more a getting used to issue than inherently bad. The Jordana that came later had a much better keyboard. 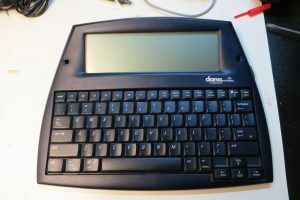 Nothing compares to the dana’s keyboard, which was built for touch typing and was originally designed to TEACH touch typing on. The biggest drawback I have noticed in Windows CE on the 360XL is the speed, it is slow. The 360XL has a 60Mhz, 32 bit RISC CPU and 8mb of RAM; the dana has a Dragonball VZ at 33Mhz 32 bit, with 16mb of RAM. The screen redraws can be slow. I suspect the big difference is the external bus width; 16 bit vs 24 bit and the underlying operating system. The Palm OS is just much more responsive opening and closing applications and files. In and application, the 360XL seems a little faster, such as using spellcheck. Opening and closing is much slower on the HP. Saving to RAM should be nearly instant, not have a 3 to 5 second waiting hourglass. On the dana, saving to RAM is more or less instant. Saving to SD takes a little longer, but still much quicker than the HP. The dana really spoiled me, with the effortless connectivity and much more modern features. My Lifedrive spoiled me even more, with USB sync, Wifi, and even Bluetooth! Both the dana and the Lifedrive use SD card, which are the de facto standard for portable storage. A product of its time, the 360XL has a Compact Flash slot. 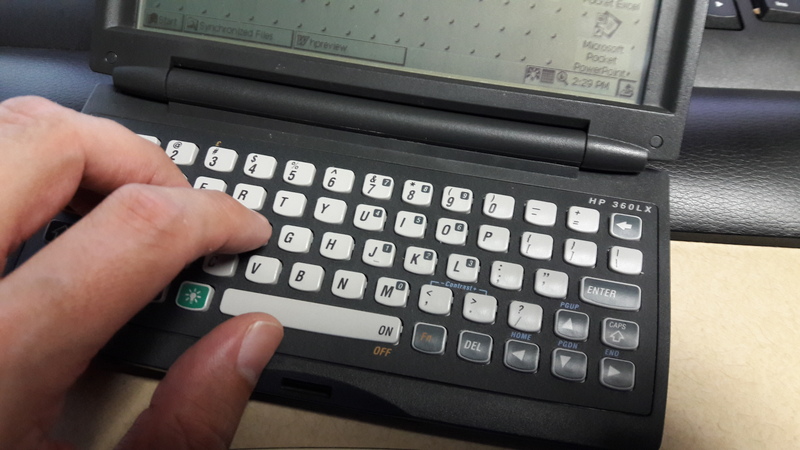 It also has a PCMCIA slot, which opens up the possibility of expansion with networking/modem, etc. 360XL. 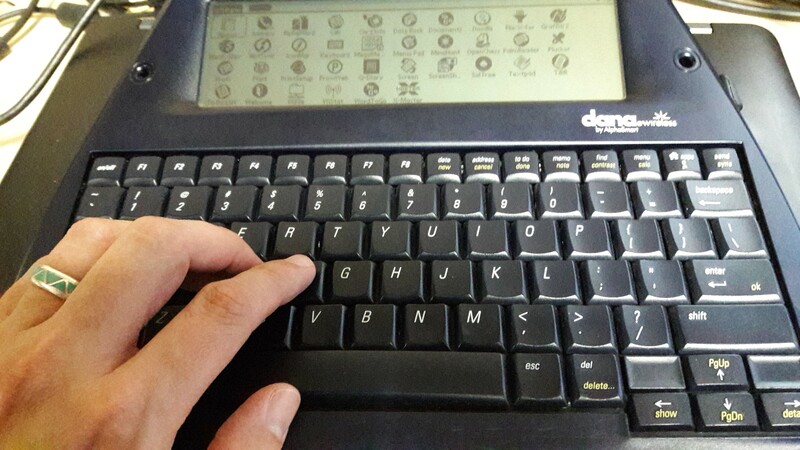 I had to revert back to my dana for finishing off the document, the small keyboard wears thin after a while. Now that I have a proper docking station, the 360Xl is a lot easier to work with. It is a creature of its time, using a serial connection, USB is still a year or two out from here. The 115,200 bits per second transfer rate sounds awful, but not as horrible in practice. Setup is pretty straightforward, just install Activesync 3.8 and a few basic setup questions and it just works. I was able to install service pack 1 and I installed the network stack. 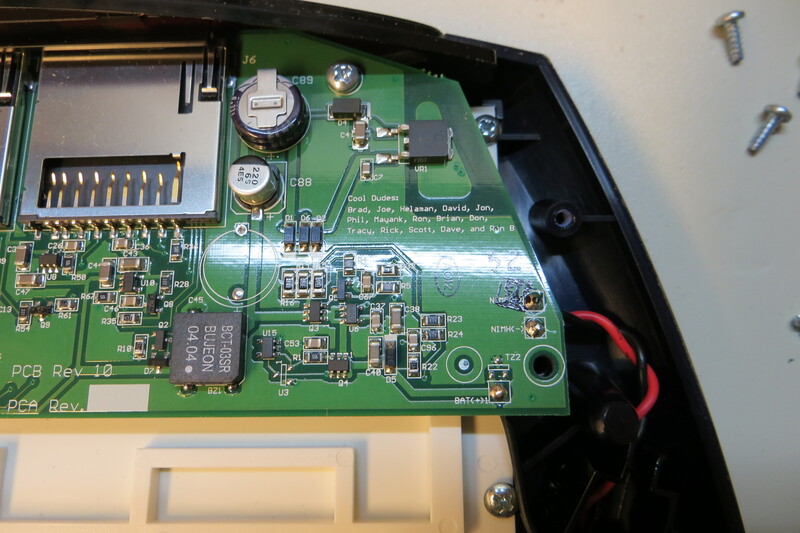 The docking station allows for charging the NiMH batteries. I am interested to see how well low drain, high capacity cells work. One of the original complaints for this handheld are poor battery life, but with 20 years of battery advancements, I have no complaints. 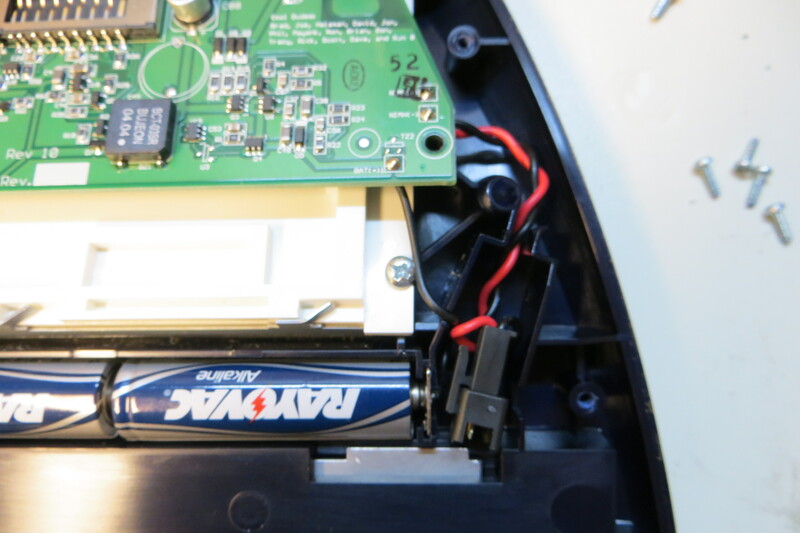 The dana also charges batteries in the unit, via USB. Both appear to have excellent battery life now. On the 360XL, the screen is much easier to see with the backlight on. 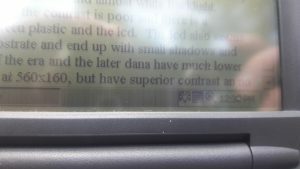 The display has an odd graininess to it, which I have not seen on any Palm device. A side by side comparison makes it more obvious. To wrap this is, I am happy with my silly purchase. I think my greatest frustration is the utter lack of software for Windows CE. You better like what came with the device, there is not a lot out there for CE 2.0. 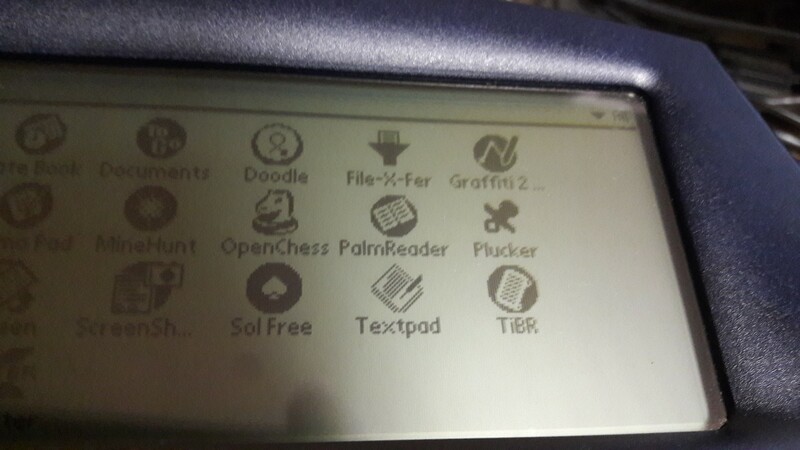 I can find more software for my ancient Palm III, which is stuck with Palm 3.0. My Plam VII, which runs 3.5 and my dana runs Palm 4.1 and I can find hundreds of applications. My Lifedrive runs palm 5.0, so it can run close to 2 decades worth of software. CE 2.0 has been long abandoned with few back ports. On a whim, I picked up a 360LX Palmtop PC. It is in my mailbox right now, waiting for a pair of AA batteries. 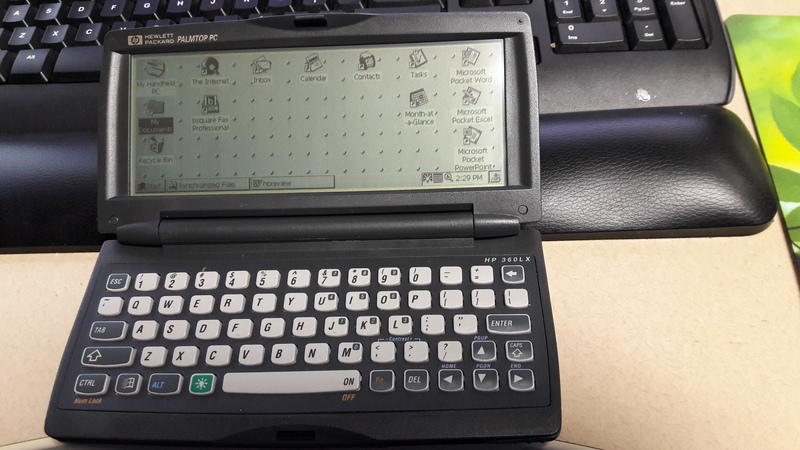 It is a Windows CE 2.0 based device, and I always loved the palmtop form factor. I’ll post a photo of the cleanup and how to sync, etc. as I work on my new toy. Actual photo of the unit I purchased, via the eBay seller. The classic look, chicklet keys, half VGA resolution greyscale screen, and CE 2.0 is why I went for the model. It also has more RAM, larger ROM, and a faster processor than the original HP 300LX. From a different seller, also picked up a dock and charger. I’ll be sure to install modern, low drain NiMH batteries. I’ll post updates as I learn about Windows CE. My latest Palm the device, the dana.wireless Palm Powered! This is a total departure from a typical Palm device. It features a full sized keyboard and a screen almost 11 inches across! 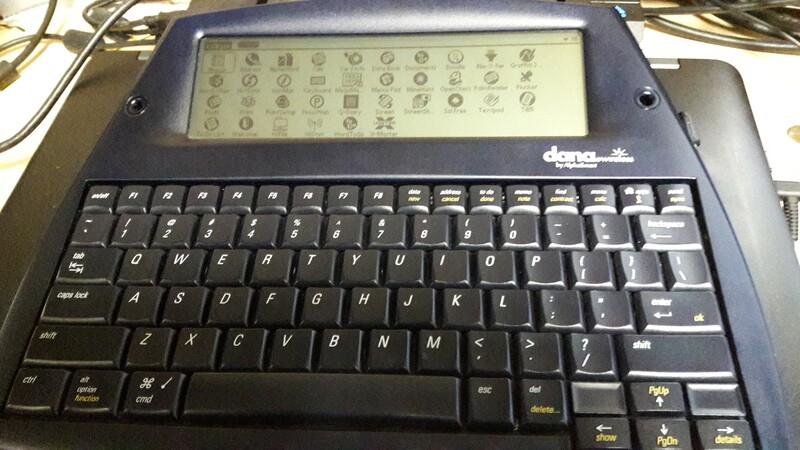 The dana is actually a descendent of stand alone word processors. 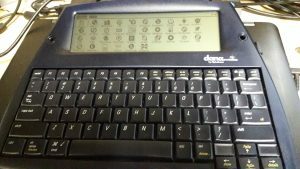 I have wanted a dedicated word processor a while, and I wanted a device that was capable and compatible with the modern world of computing. The dana features not 1, but 2 SD slots! 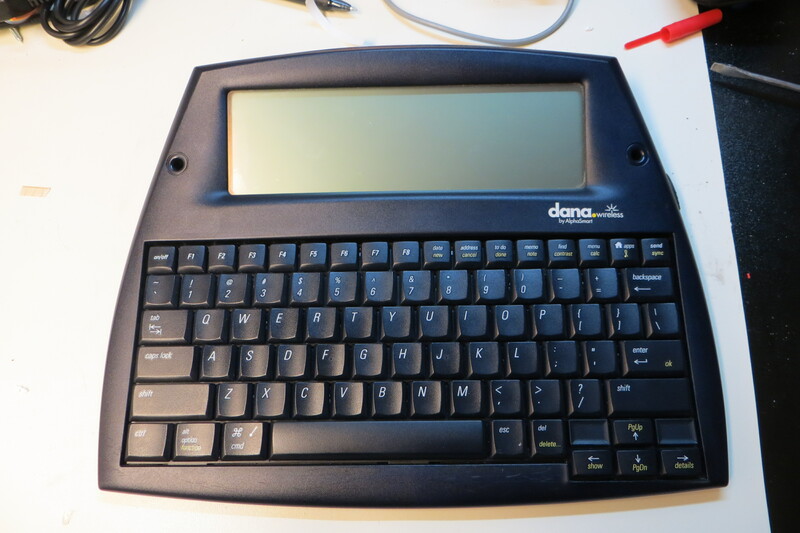 In addition, the dana shows up as a USB keyboard when it is plugged into any computer made in the last 20 years or so. 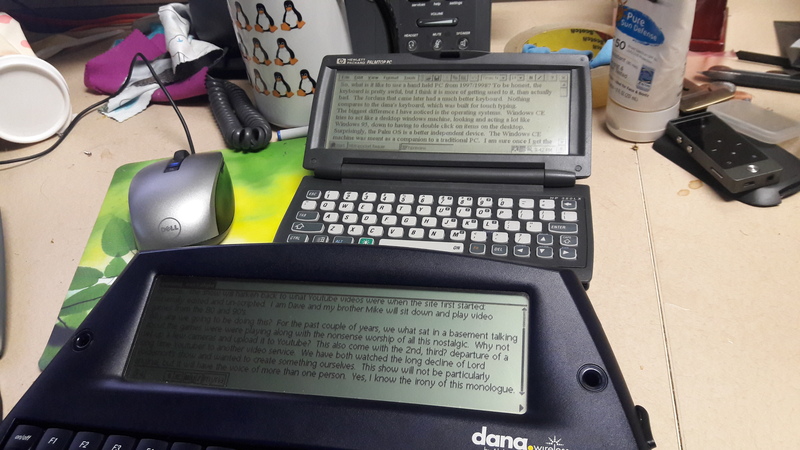 When you have a document open, just press send twice and the dana ‘types’ your document back to the connected PC. I have tried it under Ubuntu, Windows 7, 10, Mac, my Android phone, and even a Raspberry Pi, and it works perfectly. 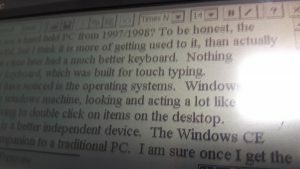 As a Palm device, it is a very capable machine, with 2mb of ROM and 16mb of RAM. My dana runs Palm 4.1 and does everything a Palm device is supposed to do. It runs every application I run on my other Palm devices and even syncs perfectly with jpilot on my Ubuntu machine. In fact, it is the only USB based Palm that I have gotten to sync with jpilot. All of the standard Palm applications are there, datebook, to do, address, date etc. On the dana these applications run wide screen, which actually makes them easier to use. The monochrome screen is easy to read in all lighting conditions. The dana originally came with a NiMH battery pack, but my was switched over to conventional AA. 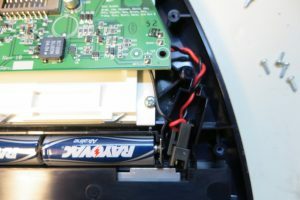 Using a slightly modified instructions here, I installed 3 Amazon Basics eneloop type, low rate self discharge batteries. 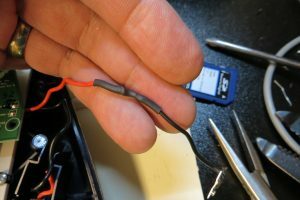 What I did differently was desolder the positive battery lead, cut the battery pack positive lead, and spliced those together. I still don’t know what the battery life is like, but my guess is at least 25 to 30 hours between charges. The great part about this mod is, if the batteries fail, I just have to pop the hatch open and replace the set. The real reason I wanted this device is to create on it. It really is a liberating device. There are no distractions, no intent, no e-mail, no Facebook. It has one job to do: to write on. It does that job very well. 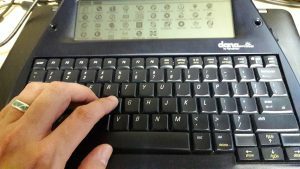 The built in word processor has adjustable type fonts, formatting, and even a spell checker and thesaurus. The keyboard is extremely high quality, that feels like a desktop keyboard, not a laptop keyboard. Each key press has a satisfying click. One feature that really stands out to me is on the back: The Made in USA label. It has been years since I have used a piece of American made electronics. For less than $25 I was able to pick this baby up on ebay, but the prices seem to be climbing higher. P.S. In case you haven’t guessed, the text for this post was done entirely on the dana! The Palm LifeDrive was a in interesting concept. It was a Palm designed to store all of your data. When plugged into a PC, it could appear as an external drive, to store everything. The unit shipped with a 4gb Hitachi MicroDrive. Of course, today, this would just hold a tiny part of our digital lives, but in 2006, it was huge. On my particular LifeDrive, I replaced the MicroDrive with a solid state CompactFlash drive. I’ll add instructions later. Also, for anyone looking for it, here is the updater software for the LifeDrive. To be added later. 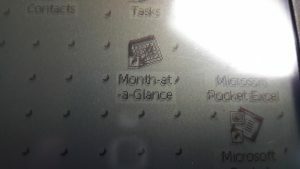 Palm IIIe, Running Palm OS 3.1, not upgradeable. 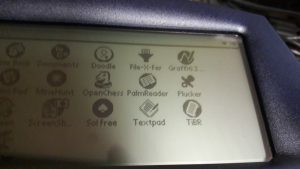 Palm VII, Running Palm OS 3.5, fully upgraded. Palm LifeDrive, Running Palm Garnet 5.4.8, replaced MircoDrive with CompactFlash card, upgraded to accept 32G SmartMedia card. This is a great device, by the way. 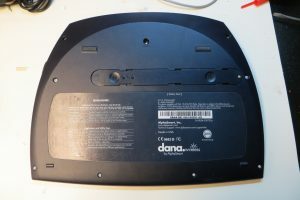 dana wireless by Alpha Smart, Running Palm OS 4.1, battery hacked to replace original battery pack. Now, accepting the fact that I am Palm junkie, I went looking for software. What I found was a mess. I am having a heck of a time finding sites with links less than 10 years old! So, now it falls to me. As I find software, I will post it to this website, to help all the other Palm users out there who still enjoy this platform that started the whole smartphone revolution, not Apple. 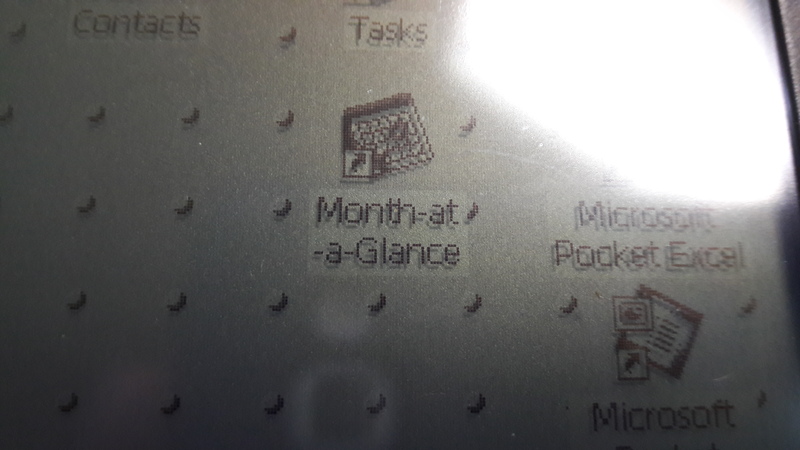 Even on the iPhone X, you can see the DNA of the original Palm Pilot, and that should not be forgotten. In other news, in case anyone needs the iso of the cd that came with the Sharp Zaurus SL-6000, you can can download it here. It is a collection of portable and console based retrofitting of Raspberry Pi computers into dead systems to bring them new life! I decided to revive this site, I feel bad about not updating since the departure of my Zaurus SL-6000. I was tempted to turn it to a Palm site, but that is a pretty dead platform as well. It was an amazing piece of technology, and a great prediction of what smartphones would become. Anyway, I do have other computer interests. I run Ubuntu on my home computer and netbook. I also recently received, as a gift, a Raspberry Pi 2. (Thanks Mark!) I already had a Pi 1, but as useful as it was, it had to run Raspbian or similar. With the 2, I finally had the opportunity to run full blown Ubuntu for Arm! You can run Noobs and install a myriad of operating systems, including Raspbian, which is a Debian based Linux distribution. Ubuntu is also Debian based, but has a lot of support, and supports ARM based processors. Since that has been primary operating system for about the last 5 years, it was a natural choice. I decided to go with Linux MATE. The Pi lacks the hardware to run Unity, so MATE is a great alternative with a similar user experience and is a an easy to use Gnome based environment. These expand the file system to the full size of the card you are using. This is enough to get you started. Next time I will detail what speed improvements I eeked out of this affordable hardware. Believe it or not, I still maintain and update this site. 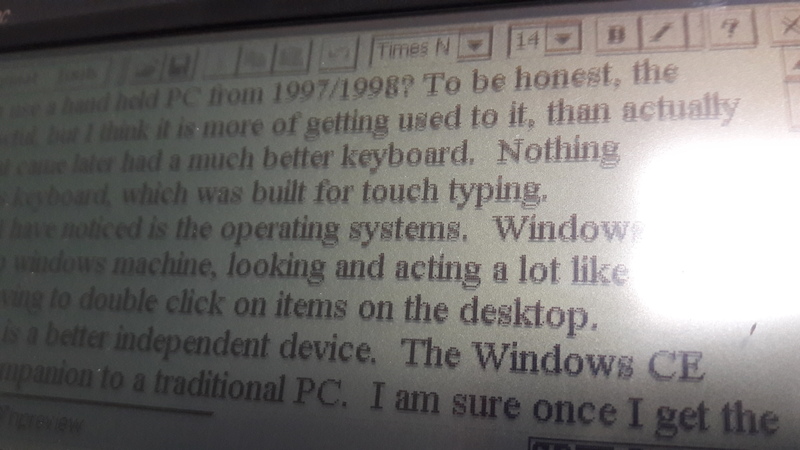 I was thinking to add Palm (I still have a working Palm III) applications and my thoughts of the current world of portable computing. In the meantime, the feed is still alive, and if you want to add an app, please leave a comment below and I will get in contact with you. Had to move my old Zaurus site to MySQL 5, the old one was running on a really, really old version of WordPress, so I was not able to properly move everything. But, at least the feed was unaffected.